1. A Good Quality Knife (Food Network) These are similar to the one I have, but mine is an old model, but it is the best! 3. Aroma Rice Cooker and Food Steamer (Aroma) I use my rice cooker mostly for cooking beans, but it is such a great appliance to have! 4. Personal Mini George Foreman 2-Plate Grill (George Foreman) I love this for making grilled Panini type sandwiches! 5. A Garbage Bowl (Food Network) I will always love Rachel Ray and her quirkiness! 7. Vegan Slow Cooking For Two (Kathy Hester) This looks awesome! 10. Microplane Classic Zester/Grater (Microplane) A must have for any chef! 15. 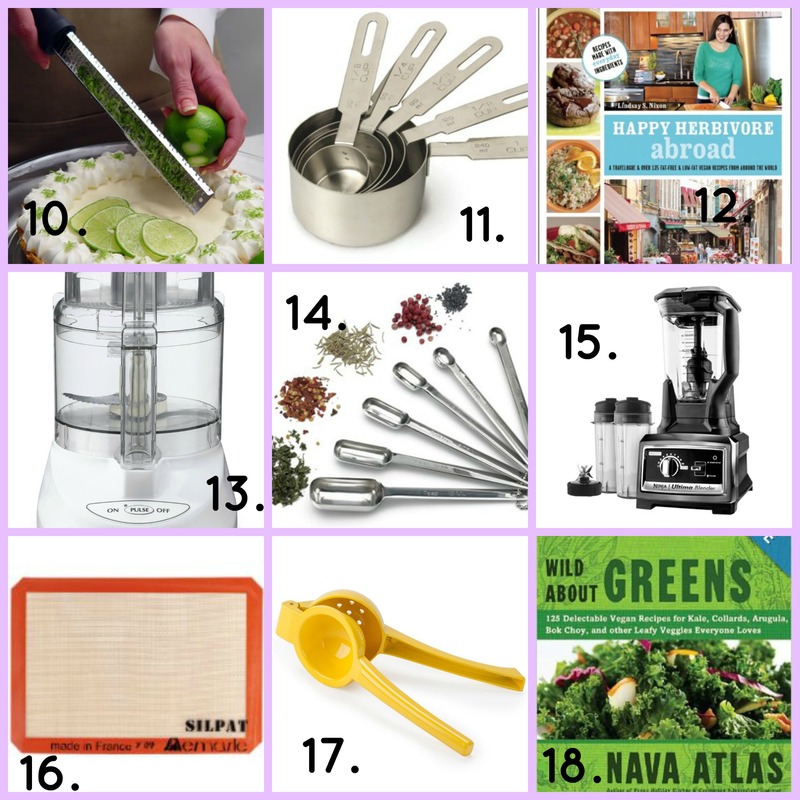 Ninja Ultima Blender (Ninja) This is my #1 item on my wish list! 20. Cuisinart Indoor Griddler (Cuisinart) All your grilling needs indoors! 21. Cast-Iron Skillet (Lodge) I have always wanted one! 24. Stem (Quirky) I have no idea if this works, but that is pretty cool! 25. Magnetic Veggie Peeler Set (Progressive International) I own these! One is a peeler, another juliennes, and the last is serrated! 26. Food Dehydrator (Excalibur) I would love to make raw wraps and what not with this! 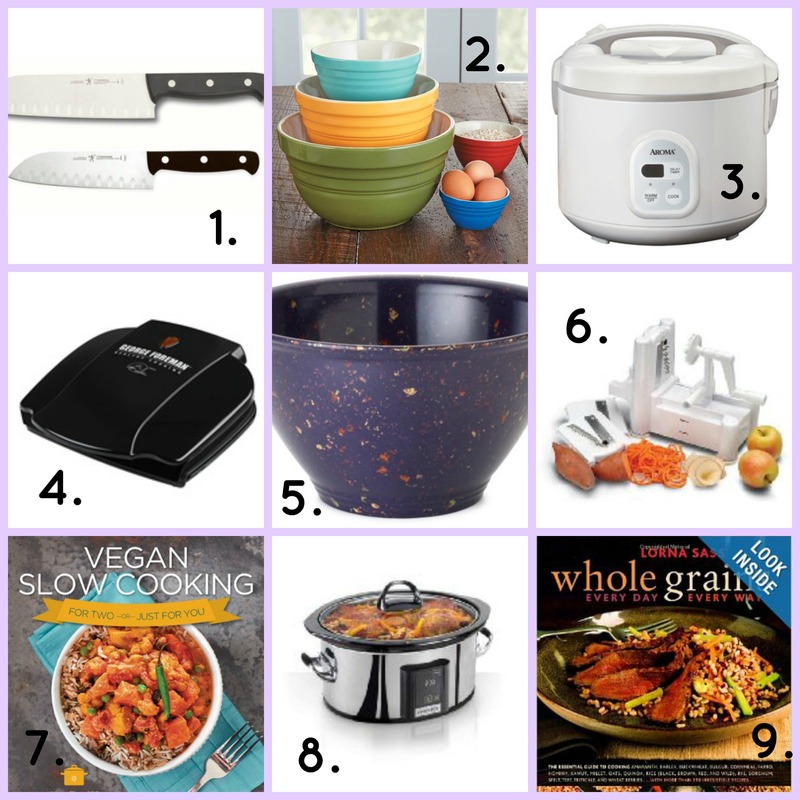 What foodie gifts are you wanting this year? 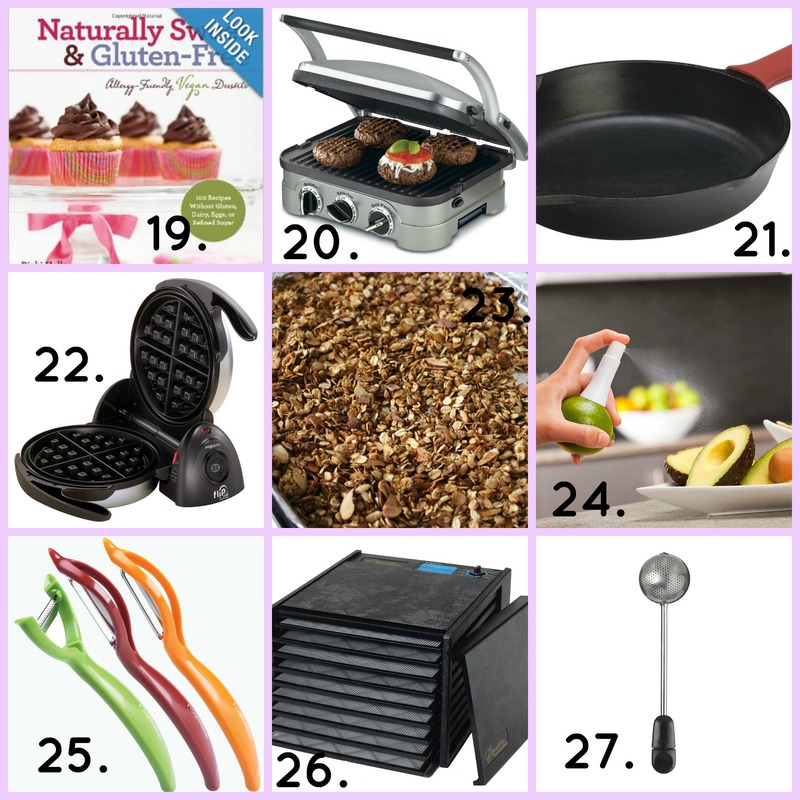 What is you most utilized kitchen appliance or gadget? I love my Food Network knife and measuring spoons! Can always use more measuring cups. My husband would prefer that I get the stainless steel ones because things like turmeric and matcha stain the plastic ones LOL. I want a food processor and a better blender. O I know!!! Or like red curry paste….but eventually it comes off! OMG, I am in foodie gift heaven! I am dying for someone to gift me with a dehydrator and a spiralizer. Hint, hint, honey! I am so glad you shared these awesome selections on the Healthy , Happy, Green and Natural Hop! Have a Happy Holiday! Girl! Now I want all of these, haha! My most used kitchen items? Mixing bowls, nonstick saucepan/frying pan and my beloved crepe pan – ooh and cake tins too! Id love replacements for my old off-label food processor and stand mixer… and a replacement microplane! I love having cast iron pans, especially as I used to be anemic. I also love my garlic press and zester. Oh, my digital scale is fab, as I bake bread often. I don’t do much making, but I do want a scale for more accurate measurements. Wow using cast iron really helps with anemia?